I few weeks ago, I thought to myself, “I promised the GB4G readers a review of John McDougall’s Jesus was an Airborne Ranger, and… since November 2 is the day I processed into Ranger School (23 years ago mind you), I’ll release the review on that day.” So, here’s the November 2-commemorative-review-of-a-Ranger-book. That has a bit of a ring to it, so this “Ranger review” might just become an annual tradition of reviewing “Ranger things” on November 2. To be fair, this review has to be done from two perspectives, namely, from the perspective of a reader who has served in the military (and particularly one who has served as an Airborne Ranger), and also from the perspective of a reader who has always been a civilian. That reminds me… when we were at Ft. Bragg, my wife used to laugh at the way Airborne Rangers referred to “civilians” – as if they were a different species. Although my early adult years were spent in military environments (at The Citadel from 1988-1992 and with the 82nd Airborne from 1992-1996), the majority of my career has been in Christian ministry (1996-present). Thus, I’ll give it my best to be objective with both perspectives. The first thing the reader with a military background will note is the woodland camo pattern on the book cover. Right away I thought to myself, one of two things is going on here. Either the author became a Ranger before the woodland camo was replaced by the digital Universal Camouflage Pattern in 2005/2006 and he was using it for sentimental reasons (I have to admit it tugged at my heart strings to see the tab and the old school camo) or the PC police required the publishers to use a camo pattern that is no longer in service in order to avoid an “unintentional” U.S. Army endorsement of such an overtly religious book. Heaven forbid that the Army acknowledge Christianity! Of course, Sikh’s can have Army endorsed headgear and we have to be careful not to offend Muslims, but Christianity is fair game to beat on. Oh… I’m getting off track. Back to the book. The book’s content is, as one would expect with such a title, filled with military jargon. 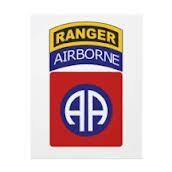 The terminology and experiences of paratroopers and Rangers abound. For someone who’s “been there, done that,” the book does a great job bringing to life moments of exhilaration (jumping out of an airplane for the first time), exhaustion (pausing during patrols in Ranger School for a change of leadership and praying your roster number will not be called out), and completion (the feeling one gets after hearing an instructor at Jumpmaster School say, “You’re a go”)! I found myself reminiscing quite a bit while going through the book. In some cases, the overuse of terms distracts from the books message (e.g. by the time you get half-way through the book, you’re tired of hearing about the “Great Raid”). Furthermore, references to Jesus as a “Ranger” and the apostles as “His Rangers” was hard to manage in my mind. I can only imagine what it would be like for the civilian reader. The overuse use of terms leads to a loss of interest—at least that’s how it impacted me. Theologically, the book’s thesis is a good one, namely, that the portrayal of Jesus in Western Christianity as a pacifistic-peace-at-all-costs-pushover does not reflect the complexity of the Christ that is described in the Bible. With respect to the overall message of the book, I would say Chaplain McDougall is dead on. However, rather than building on the main theme theologically, the book takes a youth-group-like approach to Bible study by simply re-telling the Passion of Christ with Ranger/military terms instead of drilling down on the main topic. For biblically informed readers, there is nothing new besides the replacement terms. For those readers who have no biblical background, it would have served them better to have supported the thesis with a theological conversation rather than redundant semantics. For both military and civilian readers, there are times when the “Jesus was an Airborne Ranger” concept seems very forced. For example, when discussing the calling of Matthew, McDougall writes, “Again, using the infantry motto, Jesus said, “Follow me and be my [recruit]” (page 89). At this point in the book it seems the lines get blurred and one has to mentally look away in order to refocus. Overall, I enjoyed reading the book and I agree with the primary message, namely, that Jesus was a tough guy who was able to handle everything that this world and the demonic forces of hell were able to throw at Him. I also appreciated the word of warning to those who decide to stand up and fight with Jesus for those things that are right and true. As you fight your personal battles, you will face trials and hardship. As you defend your family from spiritual attack, you are bound to take a few blows. As you move out of the bunker and cross the LD on behalf of your community, you are sure to come under fire. This is the cost of doing battle—no one comes out unscathed (page 146). In summation, I would give this book the following rating out of five stars. I wanted to think highly of McDougall. However, he should not make remarks about the Jesus of the Churches. We do not think of our Lord as weak and only a warrior. Our Christ is the true Lord and to suggest otherwise is to blaspheme him. Those Orthodox Christians who lost their lives because they would not renounce God, are not weak. You army rangers are arrogant if you think that only you represent the Lord. I have always loved Jesus, and if you think that you are closer to him because you are soldiers, think again! The millions of traditional Christians who work hard and pay their taxes, make it possible for you to do what you do. Remember that before you start touting your horn.